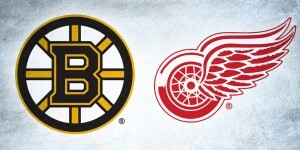 Hockey’s getting back into the swing of things a little earlier this year with the return of the World Cup of Hockey, kicking off at Toronto’s Air Canada Centre on September 17th. 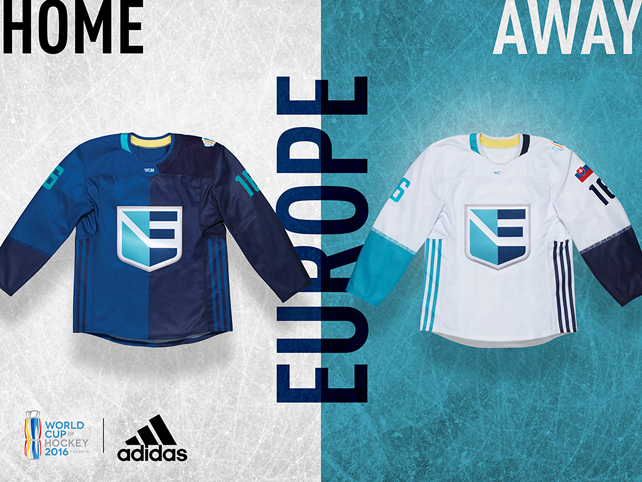 Our crew already broke down each team’s uniforms when they were revealed back in March, but the masks are rolling out fast for the highly anticipated tournament, so let’s take a look at the European teams. 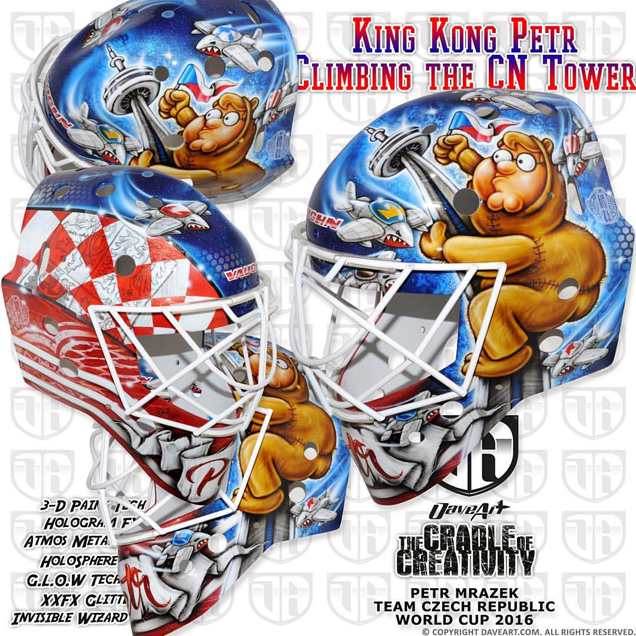 Unlike the neatly blocked order of teammate Neuvirth’s mask, Mrazek’s World Cup bucket has a lot going on and something different to look at from every angle. The Red Wings netminder has amassed quite the collection of Family Guy masks (although admittedly, he doesn’t actually watch the show) so why break from tradition? 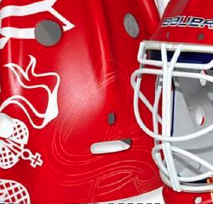 One thing about Mrazek’s World Cup mask is that it’s the first we’ve seen to actually reference the host city of Toronto. The character by his same name, dressed as King Kong and holding a Czech flag, climbs Toronto’s CN Tower on the left side of the mask surrounded by cartoon fighter jets. “It is a plane for each of the teams in the tournament,” Gunnarsson shared on Facebook, and if you look closely, you can see the team logos on the tops of the jets. The right side of the mask takes a more traditional approach through using the Red Wings logo and Czech crest and checkers to fill in the side. Like most of Gunnarsson’s work, this mask definitely fits the “storyteller” mold, as clearly a lot of thought and creativity went into the concept, but the left and right sides unfortunately seem disjointed, and that’s where this design falls short. If anyone can succeed at combining a whole lot of ideas into one simple design, it’s Dave Gunnarsson. 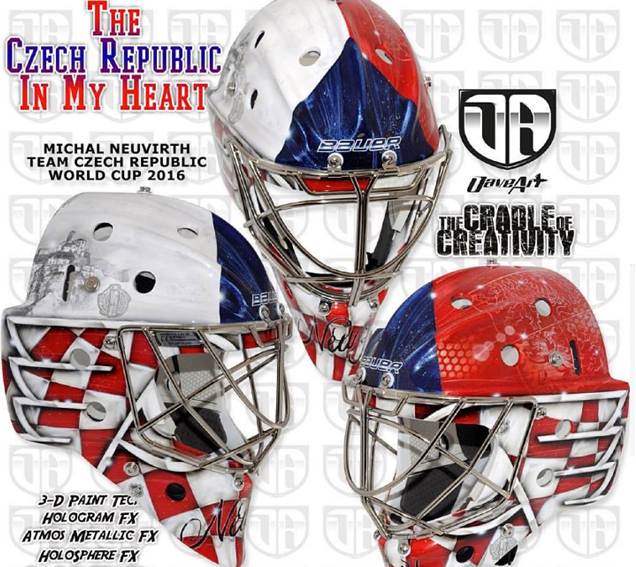 For Michal Neuvirth’s Czech World Cup mask, he did just that, so let’s start at the top and work our way down. 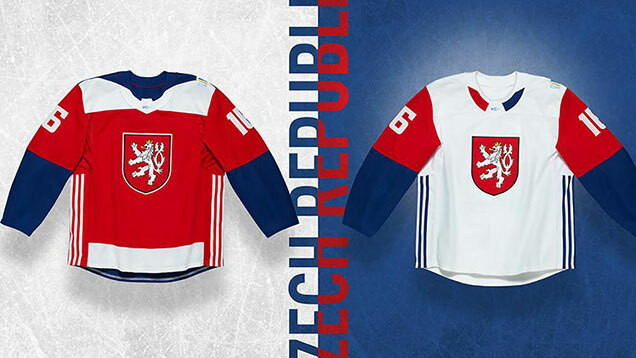 “The whole design is built on the Czech flag,” Gunnarsson shared on Facebook. 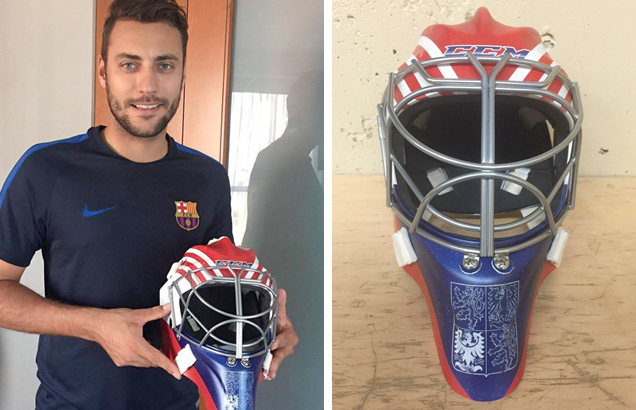 The top of the mask is divided into the red, white and blue of the Czech flag with sketch pen detailing of the World Cup logo, plus the country’s crest and landscape, including a castle from Neuvirth’s hometown of Ústí nad Labem. There’s certainly a lot going on in this mask, but Gunnarsson manages to create a bold and organized design that is beautiful both up close and from afar. This one will look sharp with the Czech jerseys and be a pleasure to watch take the ice. The third and final Czech mask for this tournament also comes courtesy of Dave Gunnarsson. 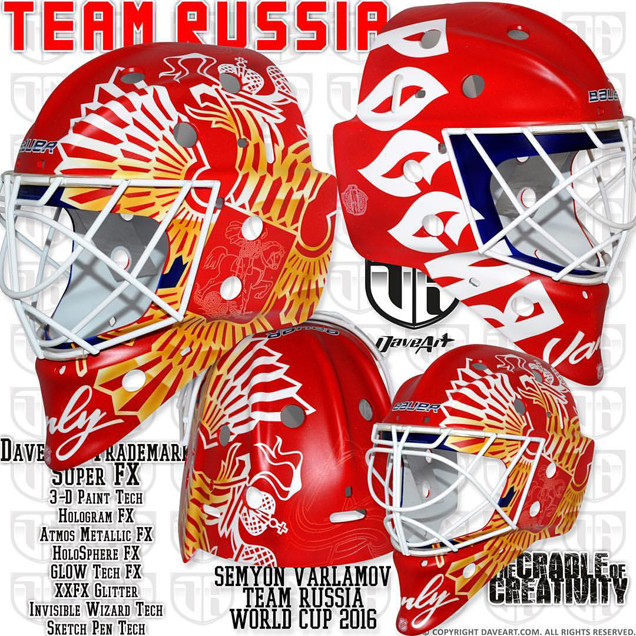 Like Ben Bishop’s, Pavelec’s mask for the World Cup also makes good use of the matte paint surface in a patriotic red, white and blue palette as well. Pavelec’s bucket is color blocked similarly to his teammate Neuvirth’s but without the sheen and special effects. From what we can tell, the mask is divided up to mimic the pattern of the Czech flag with some additional diagonal striping on the top and an outline of the Czech shield on the chin. In contrast to Mrazek’s wacky cartoon aesthetic, Gunnarsson took a refreshingly simple approach to Pavelec’s mask that’ll look really clean and crisp on the ice. Andersen has had his fair share of awesome lego-themed masks in his time with Anaheim, and the now Toronto goaltender has wisely chosen to continue the trend for the World Cup. 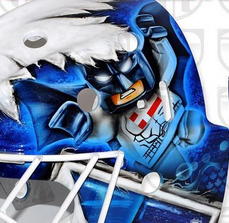 From Freddie’s home nation of Denmark, the lego batman makes an encore appearance on the left side of the mask above an angled team Europe logo with bevel effects. The blue and white design plays double duty by incorporating the new silhouetted maple leaf on top, a pretty prominent nod to Andersen’s new team. Tiny holographic maple leaves also fill the area surrounding the Danish lion on the right side of the mask, potentially making this mask fit for regular season play as well. Update: Andersen will be replaced by Philipp Grubauer, sitting out the World Cup with injury, but keep an eye out to see if he sports the design in the regular season. 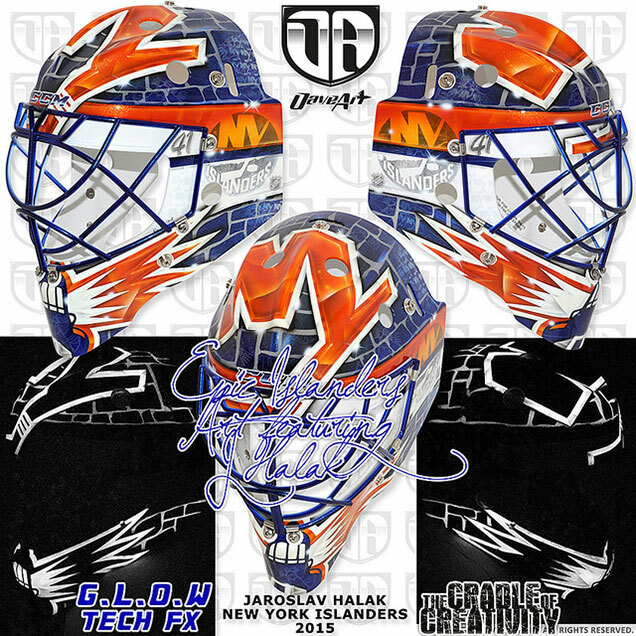 Having previously used his masks to promote Autism awareness, Islanders netminder Thomas Greiss continued to show his support in a big way through his World Cup mask. 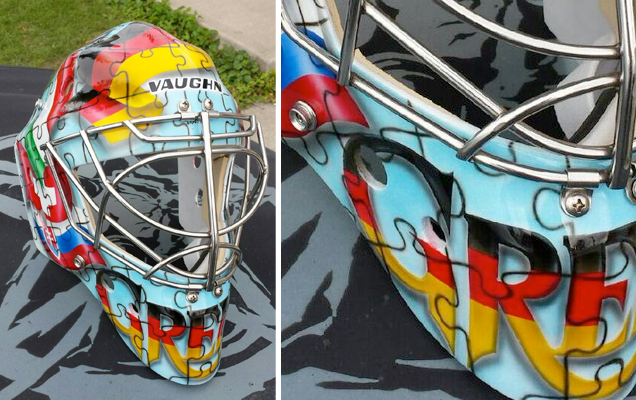 As revealed by Greiss’ wife Brittney on Twitter, the German goaltender used puzzle pieces as a symbol both for Autism and the coming together of different countries to make team Europe. 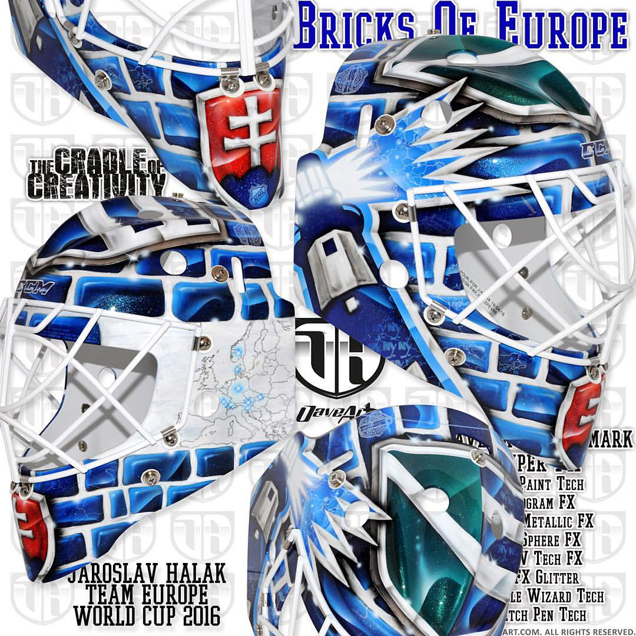 Artist Blake McCully placed the German flag most prominently on the top and in the letters of Greiss’ name on the chin with the remaining European countries’ flags waving around the side of the mask. While the symbolism of the puzzle motif is really creative and thoughtful, unfortunately it creates a lot of busy lines that complicate the flow of the flags and break up the softness of the light blue background. The result ends up looking a bit jumbled, and the sheer number of colors overwhelm the design. Like Andersen, Freddie’s teammate Halak did a nice job of integrating his NHL team, home country and personal style into his mask for the World Cup. 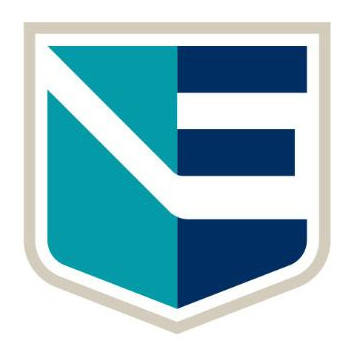 Even with a great logo, team Europe’s two-tone jerseys for this tournament are less than appealing, but the blue color of Jaro’s mask will compliment the colors of the unis nicely. 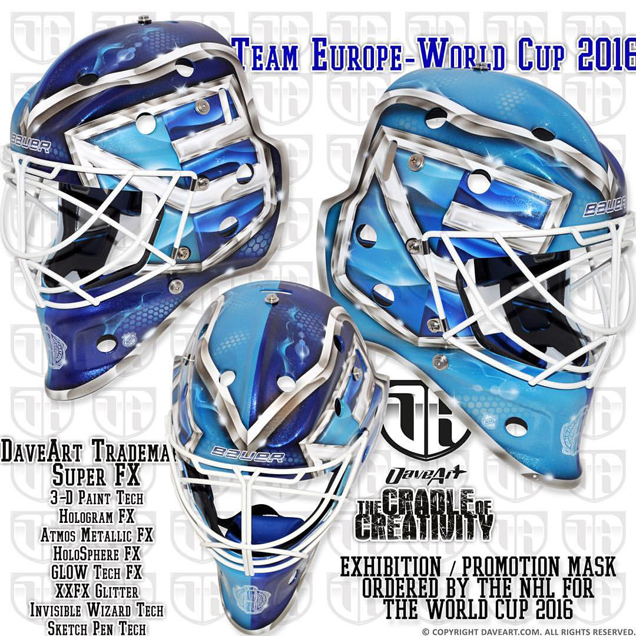 While no one will actually wear this mask, Dave Gunnarsson was commissioned to create generic promotional masks for each of the teams in the World Cup tournament. Having the freedom to work client-free, the door was open for Gunnarsson to choose the style and personality he wanted for each team. 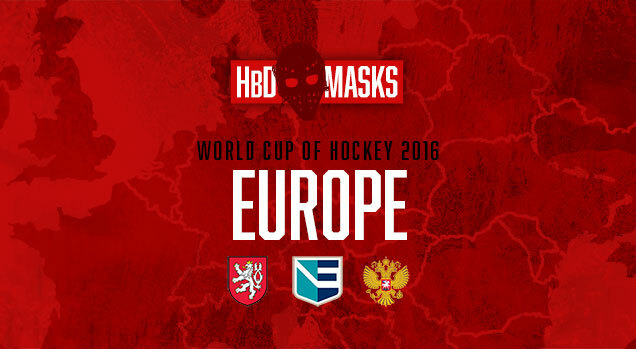 Europe’s mask seems to have been inspired by the team’s jerseys with the two-tone split down the center. 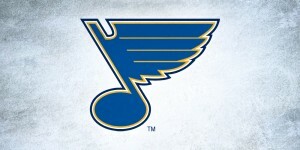 Gunnarsson chose to place a hyper-beveled Europe logo on each side with a chrome-effect border connecting the two in the center. The World Cup logo sits over the color seam on the chin, and special effects like light flares are honeycomb holograms are woven in throughout. This design seems like Gunnarsson’s translation of the jerseys into mask form and is a nice dynamic take on the unity concept. 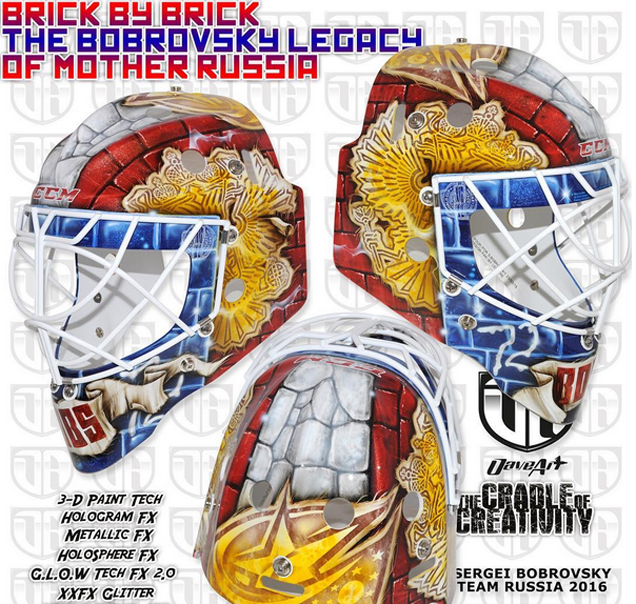 If you took every idea generated from a brainstorming session about Russia and goaltending and threw it onto one mask, well, you’d probably get something like Bob’s for the World Cup. The mask is covered in a brick texture, something we’ve seen time and time again from peewee netminders all the way up through the NHL. 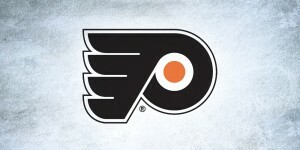 On top of the red bricks sits the Russian coat of arms–also seen on Russia’s jerseys–and a gold-washed Blue Jackets logo over the white bricks on top. On the blue bricks around the front are a screened World Cup logo and graffitied number 72. Bob’s nickname is sketched across a banner on the chin in a federation-style font, further creating a quintessentially Russian look and feel. This mask mimics many of the elements of Russia’s jerseys, which is always a nice consideration, but given all the wild and innovative ideas we see churned out by artists (including Gunnarsson) every season, the brick wall motif with some logos seems a little bit stale by comparison. This mask is clean indeed with a matte paint finish and bold, crisp graphics. 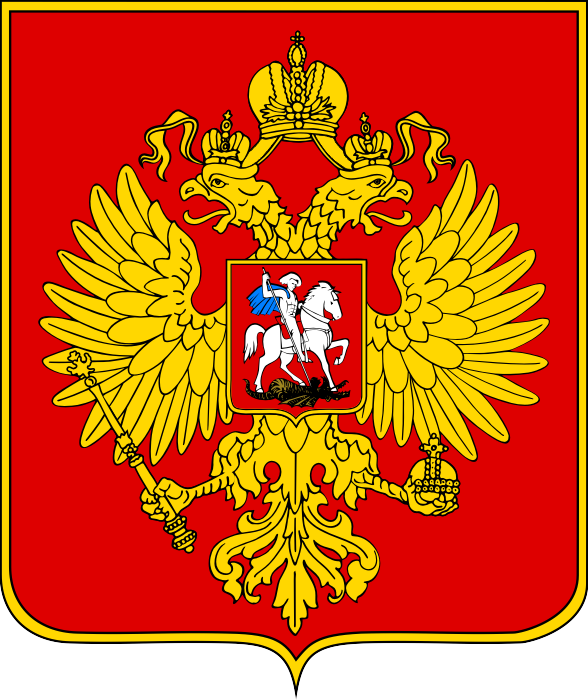 The Russian coat of arms is positioned at an angle on the left side of the mask with a gold and white gradient opposite bold white typography on the right. Offsetting the bold graphic elements are subtle sketch drawings of the Avalanche and World Cup logos, adding quiet dimension to the otherwise graphic design. This mask is a great tribute to Varly’s home country with some NHL references tied in, so overall, a really nice look for this tournament.